Do you know your body secrets? Who doesn’t like to be in on a good secret? I’m not talking about gossip, or the “dirty little” kind of secret or sneaky, clandestine schemes. I’m talking about the kind of secret that reveals itself like a thrown-open treasure chest of twinkly truths you’ve been dieing to know. The kind of secret that opens your eyes, fires eurekas through your mind, bubbles delight in your chest, then allows you to breath a much needed sigh of relief. Ahhh, finally. Finally, I know. The kind of secret that’s so key to your wellbeing that it changes your life for the better, forever. I like mysteries. And I love uncovering mysteries that help me live better. And once I uncover a mystery that not only helps me, but can help others as well, I long to shout it from the rooftops. I’m pretty passionate about truth, especially the rare, hidden kind. That’s part of the reason I’m hard at work on my upcoming series of virtual courses called The Secret Life of the Body. You might remember, in the last newsletter two weeks ago, I announced open registration for the first course in the series. It’s a virtual course called,The Secret Life of the Body: Mudras (http://www.meditationfornonmeditators.com/the-secret-life-of-the-body/) that starts February 1st. As the name indicates, The Secret Life of the Body: Mudras is a course about mudras, which are basically yoga postures for the hands. 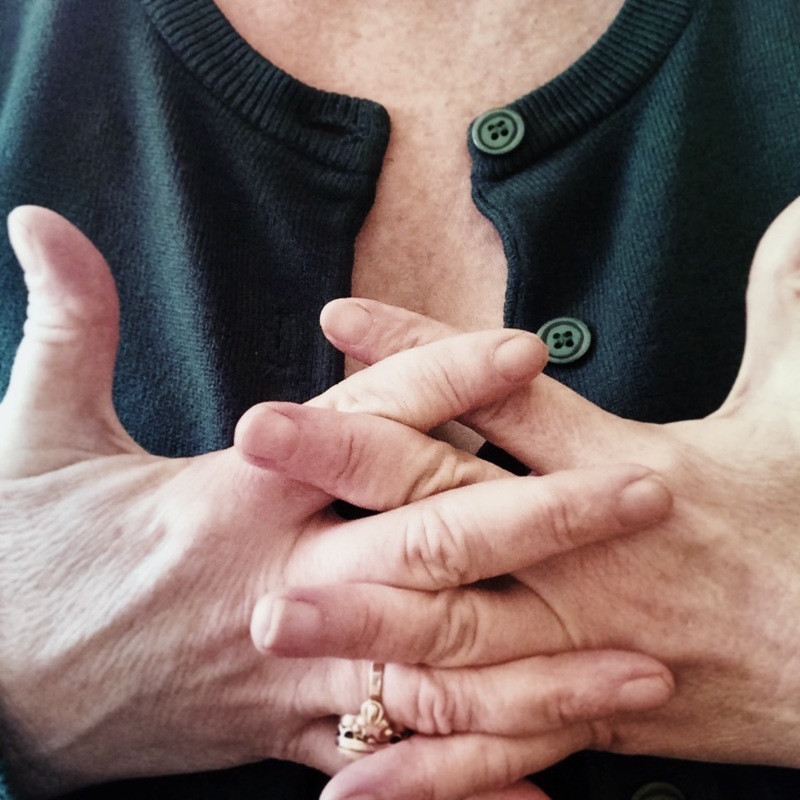 Mudras are at least as healing as full body postures. I think they’re more powerful because they’re more concentrated. The word “secret” in the name refers to the deeper, energetic part of the body– not the bones, flesh and more obvious stuff, but the more subtle interworkings– the brain, nervous system and all the body’s systems that keeps the bones and flesh alive and functioning. We’ll learn how the energetic systems of the body collaborate with one another to help us think, feel and heal– from the perspectives of the yoga tradition and modern Western science. I’m thrilled that some of you have already signed up!! So, now I’ll share one of my own secrets. When I first started learning about the energy body and exploring the deeper workings of my own body, I found a lot of answers to questions I thought would be a mystery forever. I really had opened a treasure chest of my own embodied truths. I’m still discovering, having eurekas and breathing sighs of relief. Here’s one of my discoveries in the form of a story beginning with a problem. Decades ago, I was barely functional due to anxiety. I had an irregular heartbeat, but no heart problem. Jumbled thinking but no mental disability. I experienced daily feelings of doom, nights of insomnia and an overall erratic temperament. I was often fighting back tears and had social phobias. I ate well, stopped drinking alcohol. Physical yoga, meditation, and talk therapy all helped, each in their own way. Sometimes I’d sit in meditation working with my thoughts. My mind would smooth out, the surface would calm. But underneath that calm surface, was a deep rumble poking holes through the smoothness. Sometimes after therapy, I’d find myself leaving the psychologist’s office feeling better, psychologically relieved at having the chance to talk to someone trained to listen to me objectively. Yet, I was more restless and anxious than before the appointment. As if the talking had soothed one layer of issues but had stirred another layer below. I had inquired deep into my mind. The mental digging into my issues through talk therapy was worth it. I had made progress I was proud of. I tried to accept that I’d suffer anxiety every day and night for the rest of my life. But something in me just didn’t believe it. I started to suspect that the self-healing puzzle I was working on was actually missing a piece! Then, I started making the same kind of deep inquiries into my body that I had made into my mind. I started to learn inner yoga practices and allowed myself to dig– beyond the surface of my feelings, my pain, my anxiety instead of stopping at those places– and POW! I realized that my energy body had been sending me signals all along. I began to see the “neuroses” surfacing in my mind were real, but rooted in my body. My irregular heartbeat, jumbled thinking, erratic temperament– all of those things were symptoms of my anxiety. But my anxiety was also a symptom. That my deeper body was unbalanced, out of whack. This may not be true for everyone, but it was for me– as well as many others who dared to look beyond the scary stuff. My deeper body was saying, “Yo, CAN YOU HEAR ME? Send reinforcement down here –pronto! I eventually realized my energy body had the means to rebalance itself, but it needed my help to get started. The stormy skies of my mind were mirror images of the stormy seas in my energetic body. Prior to this discovery, I had not known I had any storms in my body! I had great health insurance and saw a doctor regularly, but she was only looking at the surface, just like I had been. Seeing just the tip of the iceberg. I’m so glad I found the treasure chest, that I didn’t stop digging. I still don’t know all that I am, and never will, but I know I am much more than I am conscious of. And furthermore, I can feel that more-ness. The mind is embodied. The body has thoughts and speaks a very sophisticated language through body sensation. Many people know in theory they have a deeper power. They tell themselves that “someday” when the time is right, when they have the time (or whatever their reason) they’ll look deeper. Someday. Soon. Ish. The energy body can teach you. The energy body will also invest in you– and give you a great return on your investment– of your time spent learning and listening to what it has to say. The Secret Life of the Body (http://www.meditationfornonmeditators.com/the-secret-life-of-the-body/) is a series of courses to help you understand your embodied self on a deeper level, to put self-healing tools in your hands to tap into and work with your energetic self. Each course in The Secret Life of the Body series will put a primary tool in your hands and guide you in your own journey of inquiry, in community with others doing the same. The first tool is already IN your hands. You just need to learn how to use your hands as an energetic tool. Your hands are meant for more than giving, taking, working, fighting and loving. You always have your hands. Why not let them do more for you?